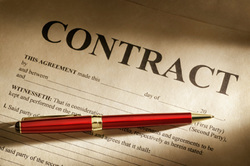 A contract dispute can cause havoc at for you and your company. Turlington Law Firm ensures clients get the compensation or services they have agreed to. We also help clients draft and review contracts to protect their interests in the future. Mediation puts the decisions in your hands and can often provide more expedient, predictable results than trial. A skilled negotiator, David Turlington can help you obtain the most equitable settlement. We are experienced in arbitrating, mediating, and litigating contract disputes in all levels of the various courts of the State of North Carolina, as well as Arbitration.